After today’s epic (failed) battle to beat the hill I went back to the kitchen to relax. 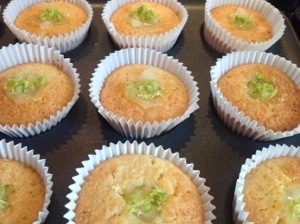 Using the basic cupcake recipe……. 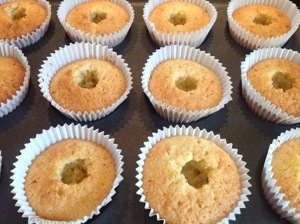 When they were done (just slightly browned) I took them out of the oven and made a little hole in each cake whilst still warm. I have a brilliant apple corer which has a serrated edge and it is perfect for this. 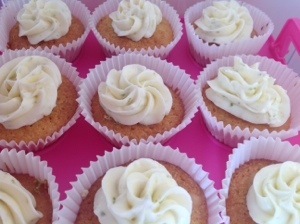 I then left them to cool and made a cream cheese and lime buttercream frosting which I piped on the top. Next time however I need to remember to add the mint element which I was going to incorporate into the icing but forgot!!! These beautiful little gems were better than I expected. I wanted something ‘healthy’ after all the chocolate bits I’d been making so though that sponge and fruit might make a good combination. And of course, anything with fruit is healthy so you can eat lots of them!!! I had also bought too may apples of the ‘wrong’ type that were not being eaten so had to find something quick and simple to do with them. The light brown sugar added to the colour as well as the flavour. I topped them with cream cheese icing and a few dried cranberries, sultanas and raisins. Add 1/3 eggs and a third of the flour into the sugar and butter. Mix gently. Add the second egg and third of the flour and mix again gently. Add the last of the egg and flour mixture in to the butter and sugar.